This week, it occurred to me that time management is similar to a rubber band. No, not because it makes a cool sound when you pluck it, or because it is fun to flick at other people. Check out what this lowly office supply can teach us about effective time management. Just like you can wrap a giant rubber band around a pile of papers to keep them all in place, time management is the thing that holds all of the different pieces of your life together. There is more to time management than just deciding what to do when. It’s about staying motivated to take care of your priorities in an efficient and organized fashion. This is why your productivity plan can’t stop after writing a date down in a calendar. 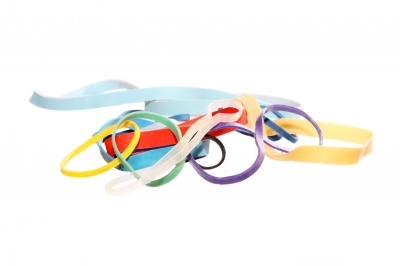 A rubber band can stretch to fit even the most oddly shaped object, just like your time management plan must adapt to the hiccups that come up in your day. This is why scripting your day down to the second is unreasonable. Things are bound to go wrong and if you plan for that in advance, it’s much easier to bounce back and change your approach. Start tasks earlier than you think you need to so they have less of a chance of catching you off guard. A rubber band can hold up to a lot of pulling and tugging, but if you pull it too hard it will eventually break. The same is true for your stress level. As you’re managing your time, you will inevitably feel stressed at some point, but you can’t let that feeling build too much. Structure small breaks and “Desserts” into your day as well as exercise and sleep to help keep stress at bay. Check out the latest book from The Time Diet! It’s a great gift for under $15!